Post your photos using the hashtag #40DaysOfPhotos on twitter or instagram. You can also post them on this blog post linky (below), my facebook page or my pinterest board. (Let me know if you want to be added to the pinterest board). If you can remember post the day the photo is or the description and maybe a reflection so we can keep track of the different challenges. If you miss a day don’t worry about it just post the photo we are up to. Since Sunday’s technically aren’t part of Lent there are NO PHOTOS on Sundays. You can save the photo of all the days for easy reference. See below for extra descriptions. If you have any questions leave a comment and I’ll be sure to answer!! And last of all HAVE FUN!! Ashes or someone’s #ashtag – Show us a picture of ashes or the ashes you received as church today. Heart – It’s Valentine’s Day share a heart you gave or received. Lenten meal – During Lent Catholics abstain from Lent on Friday’s. Share what you ate today. Every Friday during Lent we are going to share our Lenten meals. For meal ideas see my lenten meal planning link-up! The Weather – Jesus predicted his death in the scriptures. The weather man predicts the weather everyday. Was he right today? Forty – There are forty days in lent. Use your imagination post a picture to represent the number 40. Your Lenten Sacrifice – What sacrifices are you making this Lent? Are you praying more or giving something up? Bible – Our faith is routed in scripture. Share a picture of any bible – your favorite or even a family bible. Your Favorite Clergy – The clergy are an important part of the church. Share a photo of your favorite deacon, priest, pastor, bishop, cardinal, or pope. Lenten meal – During Lent Catholics abstain from meat on Friday’s. Share what you ate today. 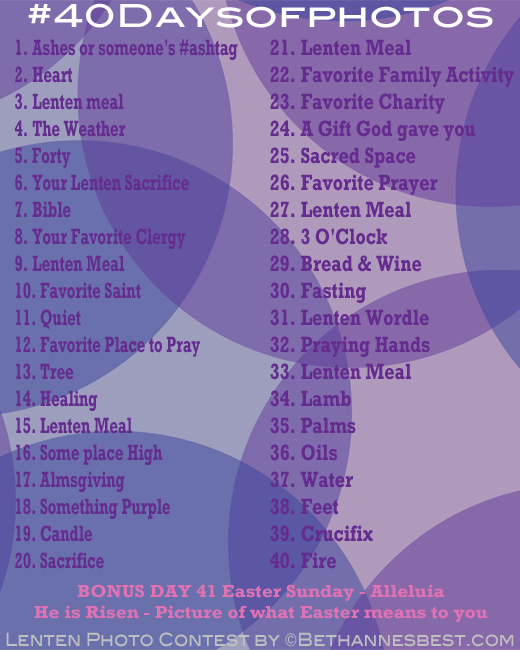 Every Friday during Lent we are going to share our Lenten meals. For meal ideas see my lenten meal planning link-up! Favorite Saint – The Saints are our role models. Who do you look up to most and why? Quiet – Share a photo of a quiet place or that represents what the word Quiet means to you. Favorite Place to Pray – Where is your favorite place to pray? Tree – A tree made a big difference in Zacchaeus’ life. Jesus also died on a cross (made out of a tree). Share a picture of a tree to remember this. Healing – Jesus was a healer. Share a picture that represents healing to you. Some place High – Jesus often preached from the top of mountains. Go some place high and take a photo and say a prayer. Almsgiving – During Lent we are supposed to give to others. Share a photo of a way you are doing that this Lent. Something Purple – Purple is the liturgical color of Lent. There is purple everywhere in the church. Share something purple. Candle – Candles are very symbolic of our faith. Share a photo of a candle to remember this. Sacrifice – Share a photo of what sacrifice means to you. Favorite Family Activity – During Lent spend some time with your loved ones and share a photo doing something fun together. Favorite Charity – Share your favorite charity to give alms to. A Gift God Gave You – When we are baptized we receive the 7 Gifts of the Holy Spirit. Share a Gift or Talent that God gave you that you are able to use to make the world a better place. Sacred Space – There are many sacred spaces in the world. Share a sacred space to you. Favorite Prayer – Share a favorite prayer and be sure to link-up to Amanda @ WorthyOfAgape’s link-up. 3 O’Clock – Jesus died at 3:00pm. Try and remember this at 3:00pm and take a picture of what was happening. Bread and Wine – At mass the bread and wine become the Body and Blood of Christ. Share a picture of any bread and wine to remember the sacrifice of the mass. Fasting – Share what you have fasted from during Lent. Create a Lenten Wordle – Make a wordle of what Lent means to you. For help how to create a wordle go here. Come up with words, phrases, bible quotes, or anything of what Lent Means to you. Type them into the box on wordle.net or tagxedo.com and it will create a pretty picture of words for you to upload to any of the websites for the contest. Praying Hands – Prayer is a big part of Lent. Share a picture of praying hands to remember to pray. Lamb – Lambs are a symbol of Easter. Share a photo of a lamb. Palms – Yesterday was Palm Sunday. Share a photo of the palms you received at mass. Oils – During holy week cathedrals around the world hold a Chrism Mass where they bless the oils that will be used to administer the sacraments. Share a photo of oils. Water – Tomorrow we will celebrate Holy Thursday where we will witness the washing of the feet. Share a photo of water to prepare for that. Feet – Today share a photo of feet to represent the washing of the feet. Crucifix – Today is Good Friday. Share a photo of a crucifix to remember what today represents. Fire – The Easter Vigil begins with a fire. Share a photo of a fire. BONUS DAY – Easter Sunday – Alleluia – He is Risen – Picture of what Eastern means to you! I hope everyone enjoys this photo challenge and has a very Fruitful and Blessed Lent!! How fun! I wish I had found this prior to Ash Wednesday, but I’m excited to jump in where I am! 🙂 Thanks!! !